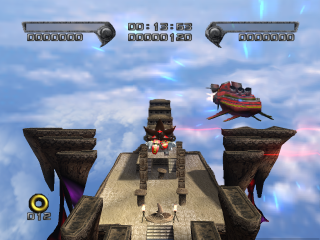 Sky Troops is one of five possible fourth stages in Shadow the Hedgehog; In the game's branching path structure, this stage the the most morally neutral of the possible five. The Black Arms have activated their ancient temples from Glyphic Canyon, transforming the old ruins into levitating stone battleships. But before they can rain destruction down upon the United Federation, "help" arrives from a most unlikely source: Doctor Ivo Robotnik. The Eggman Fleet clashes with the alien armada high above the clouds, and Shadow the Hedgehog is once again caught in the middle of a battle. The gameplay of Sky Troops keeps Shadow within the Arms fleet; he never sets foot on an Eggman battleship. Given that it is a sky battle, the level involves many floating platforms, requiring significant use of vehicles to hop between. A leftover GUN JII-G "jumping mech" must be used to ascend levitating islands in one section, and Shadow often hitches a ride on a rocket to cross from one ship to the next. When the fleets enter a storm cloud, Shadow takes a ride on a Black Volt, too. Charging up the blue Chaos Control can pay dividends here, as the flying boost won't cut out until Shadow is back above solid ground - a clause which can extend the effect far beyond its normal lifespan. There are three story routes by which to access Sky Troops: Shadow must either help Amy find Cream and Cheese in Cryptic Castle; collect the Chaos Emerald from Prison Island; or repel the G.U.N. attack on Eggman's Circus Park. Whatever the method, Sky Troops' preceding cutscene shows Eggman reviewing images of Westopolis' invasion with mounting rage, complaining "Those idiots! They're destroying everything! How can I conquer the city and build the Eggman Empire if there is no city?" . In the next scene, Shadow is at Black Doom's side, stood upon one of the floating aliens ships. Doom boasts that his armada is over 2,000 years old, and that it is "The perfect killing machine... ready to impose terror in unimaginable ways!" . His hyperbole is, however, cut short when, on the horizon, the piscine orange ships of the Eggman Fleet appear. As battle is joined between the two villainous armadas, Shadow's options are threefold. In the Dark mission, he can side with the Arms and shoot down Eggman's cruisers using the fixed-position cannons scattered about the ruin-ships. In the Normal mission, Shadow simply makes directly for Eggman's flagship to confront the fat man personally. Or in the Hero mission, the hedgehog follows the suggestions of Eggman's floating drone and sabotages the alien ships from the inside, by blowing up the power-cores he activated in Glyphic Canyon.